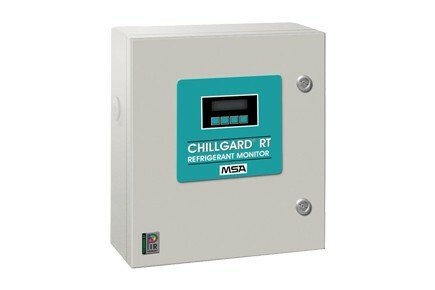 The CHILLGARD RT is suitable for all industrial refrigeration systems or chillers be it production or research operations, food cold storage or meat packing operations. It allows precise monitoring of the smallest refrigerant concentrations and detection of leak locations. Thus it protects man and environment against these hazardous agents, prevents poisoning of the cold food and helps to save costs which would incur from the loss of refrigerants. Refrigerants that endanger the ozone layer are still frequently used. These will disappear in the next few years and they will be replaced by environmentally friendly ammonia. The CHILLGARD RT already takes this development into account today. Measurement according to the principle of photoacoustic infrared absorption in the range of 0…1000 ppm. This permits monitoring below the TLV of 10 ppm for HCFC 123 and much higher concentrations in case of an accident.